Click here to read our guide on the cost of living in China. Click here to return to the main menu of the article. Above all, remember that Guangzhou is one of the cities in which you can request a 72-hour visa extension. In addition, in this guide you will find our advice for booking domestic and international flights in China. Guangzhou’s airport Guangzhou Baiyun International Airport, where both domestic and international flights arrive. It is located 28 kilometers north of the city and the easiest way to get there is by taking subway line 3. You can also take shuttle buses from various parts of the city, which come every 20-30 minutes, or the buses that come every hour from the majority of outlying cities (Dongguan, Foshan, Zhongshan, Huizhou, Jiangmen, Nanhai, Qingyuan, Shenzhen, Shunde, Taishan, Yunfu, Zhaoqing, Zhuhai y Wuzhou). Last of all, you can also take a taxi. The trip from downtown should cost a little more than 100 Yuan. Click here to read our guide to traveling in China by train (and to learn how to book a train ticket online). Guangzhou Railway Station is located in the Yuexiu district and can be reached by subway lines 2 and 5 (stop: Guangzhou Railway, 广州火车站). From this station a large number of bullet trains leave. It links Guangzhou to the main urban center of the country, such as Shenzhen, Beijing, Shanghai, Chengdu, Chongqing, Xi’an, Zhengzhou and even Lhasa. Guangzhou East Railway Station, which is also known as Tianhe Station, is the largest station in the city, and is found in the Tianhe district. It can be reached via subway lines 1 and 3 (stop: Guangzhou East Railway Station, 广州东站). From here leaves the line that connects Guangzhou-Shenzhen-Hong Kong, and therefore, it has an immigration office. In addition, it is the main hub for bullet trains in the city, as well as for K-type trains (normal speed) heading to main urban centers in the north, such as Beijing, Harbin, Changchun or Shenyang. Guangzhou South Railway Station, also known as New Guangzhou Station, is located in the Panyu district, and can be reached via subway line 2 (stop: South Railway Station, 广州南站). This station is a station for transboarding between the bullet train lines between Guangzhou-Shenzhen-Hong Kong, Guizhou-Guangzhou, Guangzhou-Zhuhai and Nanning-Guangzhou. In addition, it is the terminus station for the largest bullet train line in the world, that of Beijing-Guangzhou. 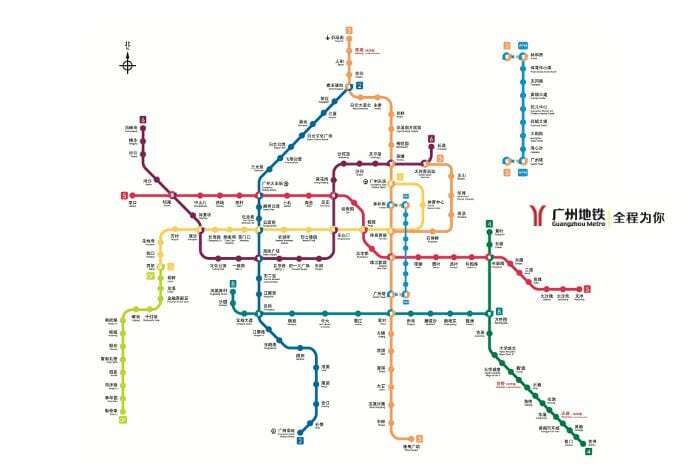 The Guangzhou subway is one of the most extensive subway systems in the country with nine lines, although it is still growing, and new lines are planned in the following years. Therefore, maps tend to become obsolete quite quickly. Currently, the official Guangzhou subway website is only available in Chinese, so if you want to check out schedules or ticket prices, the English Wikipedia article is very complete and is up to date. Here, you can check out an interactive map offered by ExploreMetro. If you are going to stay in the city (or the area) for more than two days, I suggest that you get a “Yang Cheng Tong card” (羊城通), which you can request and top at almost all subway stations as well as at authorized stories. It is a no-contract card that is re-loadable, similar to the Oyster Card in London, and equivalent to the Octopus Card in Hong Kong. To get one, you will have to make a deposit of 20 Yuan (that will be returned to you when you hand it in). To top it up, go to one of the subway station service counters (or stores with the Yang Cheng Tong symbol) and give the card to the salesperson along with the quantity you want to reload. The Yang Cheng Tong card has the advantage of being able to be used not just for public transport in Guangzhou, but also in Hong Kong, Macau, Shenzhen, Foshan, Zhaoqing, Jiangmen, Shanwei, Huizhou, Maoming, Shaoguan, Yunfu, Zhuhai, Heyuan, Yangjiang, Zhanjiang, Meizhou, Qingyuan, Chaozhou, Zhongshan, Shantou, Dongguan. In addition to the subway and buses, you can also take taxis and ferries. In Guangzhou, there are around 450 bus lines, more than 40 of which circulate during the night (between nine o’clock at night and six o’clock in the morning). The bus system in Guangzhou is very extensive, and is necessary for getting to many places, as the subway doesn’t yet cover many parts of the city well. The ticket price varies between 1 and 2 Yuan per trip. Click here to see all bus lines in the city. Guangzhou has a subtropical climate. Winters are very mild and are relatively dry, with temperatures that rarely go below 10ºC. Summers, on the other hand, are very hot and humid, with a long monsoon season. In Guangzhou, the monsoon season is from April to September, and torrential rain and typhoons are common. Statistics by Wikipedia.org (Creative Commons License). Guangzhou is the third largest city in China in terms of population with around 20 million inhabitants (which would double if you take the whole metropolitan area into account), and is one of the ten largest cities in the country in terms of surface area. Because of this, getting around the city can take a lot of time, and it is a good idea to choose where to live based on your priorities. Historically speaking, Guangzhou has been a city that has been quite open to the world, and was one of the first cities in China that opened up to the international market. In addition, its economy is mainly based on the export of manufactured products. Because of all of these reasons, Guangzhou is a quite cosmopolitan and international city, and has many areas where expats can live without changing their habits too much. In addition, the city offer a good variety of education options, including private schools, international schools, and quality public schools, as well as the possibility of finding heath care facilities up to international standards. Below, I describe the districts which are most popular among expats in the city, their advantages, and their drawbacks. The districts of the city of Guangzhou – Map of wikipedia.org (Creative Commons License). Zhujiang New Town: Bordered by the Pearl River on the south and the Huangpu Dajie on the north, this is a very popular and cosmopolitan area filled with skyscraper office buildings, foreign businesses and restaurants, and grocery stores specialized in imported products, especially in the area close to the Liede residential complex. The area is constantly being developed, and is mainly a business area, because of which the living conditions and high cost of housing make it not as attractive for living as other areas. Tianhe Bei: Tianhe Bei is located just above Zhujiang New Town and beside the Tianhe Sporting Center. 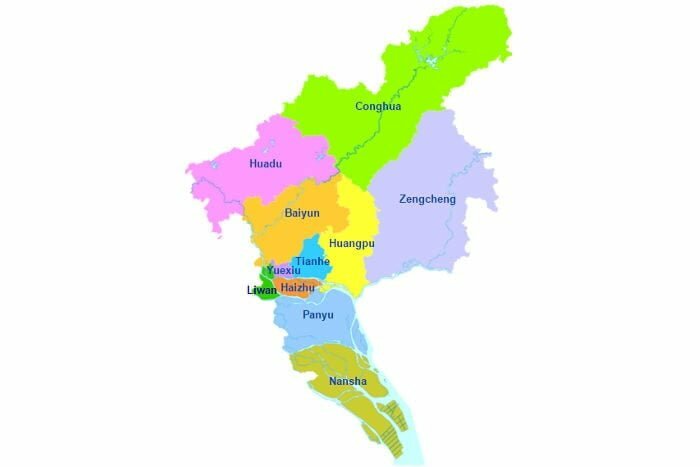 It is a developed area which has recently been filled with offices, hotels, and restaurants, with better living conditions than in central districts. However, prices are high here. Ersha Island: Located to the west of Zhujiang New Town, this is a small island is where many foreign consular officials and senior business executives live. This is because it is a very central, peaceful, and pretty area with luxurious villas. In addition, it is very close to the the American International School, which is considered one of the best in the city. Obviously, prices here are prohibitive for most people’s checkbooks. Wushan Area: This is an area close to various universities, and is very popular among students due to the closeness of campuses. The Yuexiu district is located in the downtown area, and following Tianhe, is the most popular area of the city among expats, especially the Taojin area, which is located between Huanshi Dong street and Hengfu street. Taojin is a rather dense area, with numerous heritage buildings and abundant services, such as good restaurants and pretty cafés. Without a doubt, this area has a lot more soul than the sterile new areas in Tianhe. In the past, it was the area where the majority of foreigners were concentrated, because of which real estate agents tend to have experience doing business with foreigners. However, one of the main disadvantages of this area is the lack of decent grocery stores. Another popular part of the city is the area close to Huanshi Dong street, between the Garden Hotel and the Tianhe Bei area, which was formerly the main business district of the city. Currently, it is an area filled with office buildings, shopping, and high-end night clubs. 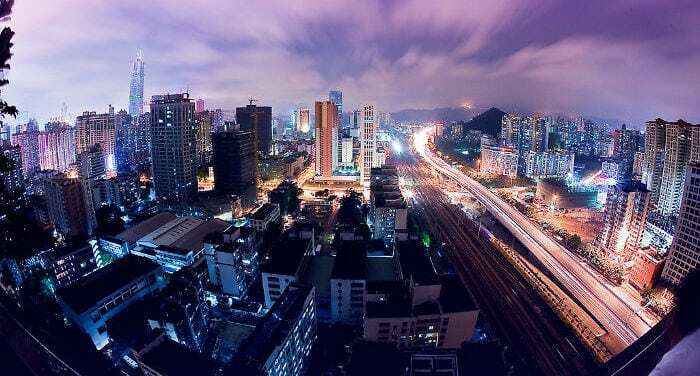 The living conditions in this district can be more complicated for expats than in Tianhe, although they are made up for by the excellent connection with the remainder of the city and somewhat more affordable rent prices. The central Liwan district is without a doubt the best place for people who want to experience a bit more of what living in a real Chinese city is like, and to enjoy Cantonese culture. Nonetheless, it’s not the right place for you if you’re looking for peace and quiet. The most popular areas are close to Hengbao Plaza and the bustling Shangxia shopping street. In addition, the presence of an enormous shopping mall with a grocery store just below the plaza makes it quite convenient for living. This district is located to the south of downtown and is currently quite popular among exparts, due to its proximity to downtown, and the fact that it is must less populated and quieter than the districts to the north of the river. In addition, its mix of old and new buildings gives it a certain charm. One of the most popular areas is the one that encircles Binjiang Dong street, where there are numerous buildings offering high-quality housing. Life in this district is quite convenient, as there exist multiple grocery stores and coffee shops. In addition, the area around Sun Yat-Sen university offers numerous night life possibilities for students. The Panyu district is located in the south of the city, and is particularly suited for people who are looking for a more peaceful area in which to live which is cheaper. In addition, its good transportation connection with downtown makes it ideal for people with a lower budget, but who continue to need services that are only present in downtown. The most convenient area is without a doubt the Shiqiao area. Panyu is also ideal for people with higher budgets that want to live in a much quieter and more pleasant areas. The Clifford Estates communities are very popular. These are high-end residences withe spectacular gardens, a gym, a pool, restaurants, grocery stores, and 24-hour security. Travel to China: Tips and Resources: General guide with all the information you need for traveling to China. Travel to Guangzhou, the capital of the Guangdong province: Some ideas for enjoying the city. The best hotels in Guangzhou: our reviews of the best luxury and budget hotels in Guangzhou. The Canton Fair: A complete guide with all the information necessary to organizing your attendance at the fair. The best hotels for the Canton Fair: Our reviews of the best hotels near the Canton Fair. Before all else, if you are thinking about traveling or living in Asia without health insurance, you’re making a mistake. If you get sick or have an accident, nobody is going to help you unless you can pay for the treatment in cash in advance or it is covered by your insurance. Click here to learn more about insurance for short stays and here if your intent is moving there to live. In China, in terms of education, for kindergarten, primary schools, and secondary schools, there are three options: international schools, private schools, and public schools. As Guangzhou is a large urban center and a large number of foreign families live there, it is possible to find the three types of schooling. In Guangzhou, there exists a large number of international schools which include a broad variety of study plans (American, British, French, and Japanese, among others). International schools have multiple advantages, including teachers with good qualifications and small groups of 10-20 students. The main problem is their high price, which can be around or even greater than 100,000 to 150,000 Yuan per year. Obviously, this option is only within the reach of people with a large amount of purchasing power or who have a work contract with a Western company that includes schooling for children. Here is a more or less complete list of international schools in Guangzhou. Chinese private schools tend to offer programs with particular emphasis on teaching English. Compared to international private schools, they are less expensive. However, they require children to have an advanced level of Mandarin. Public schools tend to be free for Chinese children, but come at a price for foreigners, although they are much cheaper than private schools. Public schools present multiple problems: education is exclusively in Mandarin, the teaching method is the traditional Chinese method (where memorization is the priority to the detriment of creativity), and homework tends to be too demanding for the majority of foreign children. And if that’s not enough, the best schools require a demanding selection process and good contacts, despite the fact that classes are very big (around 50 students per class). Last of all, one of the requirements for being accepted into a Chinese public school is that your child must reside in the area in which the school is located. That has made it so that over time, many families have moved to areas around the best schools, thus increasing the price of rent. Founded in 1924 by the founder of the Republic of China with the same name, it is one of the most prestigious universities in the country, and certainly tops the list of university rankings in the Guangdong province, even competing with the top universities in Shanghai and Beijing. The main campus of the university is located in the Haizhu district. Among its numerous educational specialties it is necessary to highlight Sun Yat-Sen Business School (SYSBS), with broad international acknowledgment, as well as its faculty of medicine, with the best network of associated hospitals in China. Founded in the year 2000 through the merger of multiple education centers in the city. it is one of the best universities in the city and country. Despite being one of the main educational centers in China, this university does not have the same national and international prestige as Sun Yat-Sen University. Founded in 1952, South China University of Technology benefits from a privileged location in the Tianhe district. South China University of Technology is one of the most prestigious universities in the country for specialties related to engineering, and forms part of the 33 key universities under the Chinese Ministry of Education. This relatively small university founded in 1964 is a leader in Souther China for the study of foreign languages and culture, economics, and world trade. Despite not benefiting from the rankings of its older counterparts in the city, it is without a doubt a leading university for people interested in international business and is a good choice for studying Chinese. Click here to see the complete list of universities in Guangzhou. If you want to buy Western brand-name products, you can find numerous grocery stores in the central districts of Tianhe and Yuexiu, and even in the university area of Haizhu, such as Rosie’s Pantry, Oliver, Corner’s Deli, Store-X Imported Food Mart, Metro or the Tesco chain of stores. Nonetheless, like in all main cities in China, Carrefur is never a bad option, as in it you can find a good selection of imported products at lower prices than in specialized stores. Here you will find a complete list of Carrefour in the city, including addresses and directions to get there. To register your address (this is a requirement unless you live in a hotel), you will have to go to the Public Security Bureau or to the local police station in your neighborhood (ask for the address from your landlord or from the agency that rented you the house or apartment). A very complete website and a mixture of blog, classifieds directory, and forum. This website is quite useful because of its list of places for expats to go during their free time, although it has many more sections. Internations is an excellent website for people who want to meet others with similar interests, sign up for events to meet other expats living in the city, or to find information and advice. MeetUp is a perfect website for people who are looking for others with similar interests, from rock climbing to wine, vegetarian food, and even Chinese literature.